Recently, I had the pleasure of visiting the Timken Museum in Balboa Park, San Diego. I had never heard of this museum until this trip to the beautiful campus of Balboa Bark, but despite its small size, it has excellent holdings in a few concentrated areas, including 18th and 19th century American art, Russian religious icons, and 17th century Dutch art. It is, essentially, a perfect little gem of a museum. The building itself was built in the 1960's, and its layout and decor reflect this fact: the walls and floors are striped marble, the lines of the building are very square and spare, with no moldings and little decorative elements, and the lights are fluorescent. In the galleries, the walls are covered with a plushy pink fabric that made me feel as if I had stepped back in time, to an earlier era of museum collection even older than the 1960s. It was a striking contrast to today's world of white- and cream- and brightly-colored painted museum walls. First I visited the American room, which is is replete with works by artists including Benjamin West (who is thought to have been born on the future campus of Swarthmore College), John Singleton Copley, and Eastman Johnson. The Eastman Johnson work, titled The Cranberry Harvest, Island of Nantucket and dating from 1880 is charming, depicting people picking cranberries with bold, evocative lighting that truly conjures up the time of day in a pleasing, atmospheric way. Also a highlight in the American room is Opus 24: Rome, From the Campagna, Sunset (1867), painted by Thomas Moran. 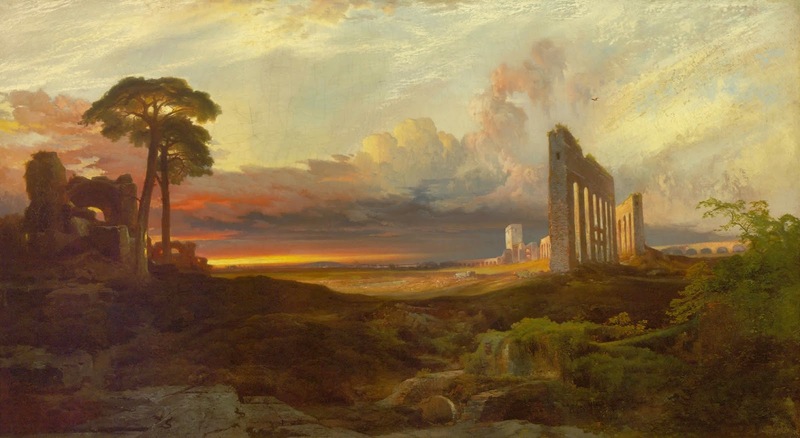 The painting, depicting a landscape with Classical ruins, is serene, poetic and almost musical, with its harmony of blue, pink and yellow in the sky. The next room I visited was the French room, which has some major "names" of French painting among its collection. Jacques-Louis David, Claude Lorrain, François Boucher, and Jean-Honoré Fragonard are all present in the room in fine form. While the latter two artists, with their soft pink cherubs and flowery scenes, respectively, are not particularly to my taste, the Fragonard, titled Blind Man's Bluff (1775-80), has an intriguing, unfinished, sketchy quality. Also interesting among the French works is a Jean-Baptiste-Camille Corot, titled View of Volterra (1838), which has a fluid, sunny quality that feels like a gentler version of Realism. Next was the Dutch room, which also contained works by well-known artists, including Gabriel Metsu, Pieter Claesz, and Franz Hals, who is represented by the charming and loosely-painted Portrait of a Man (1634). Also on display are works by Peter Paul Rubens and Anthony van Dyck, who studied under Rubens. The works by these artists are placed next to one another, and it's interesting to compare their different techniques. To my eye, while the van Dyck was more precisely rendered, it was colder than the Rubens and lacked its vim, its vigor, its sense of true life. 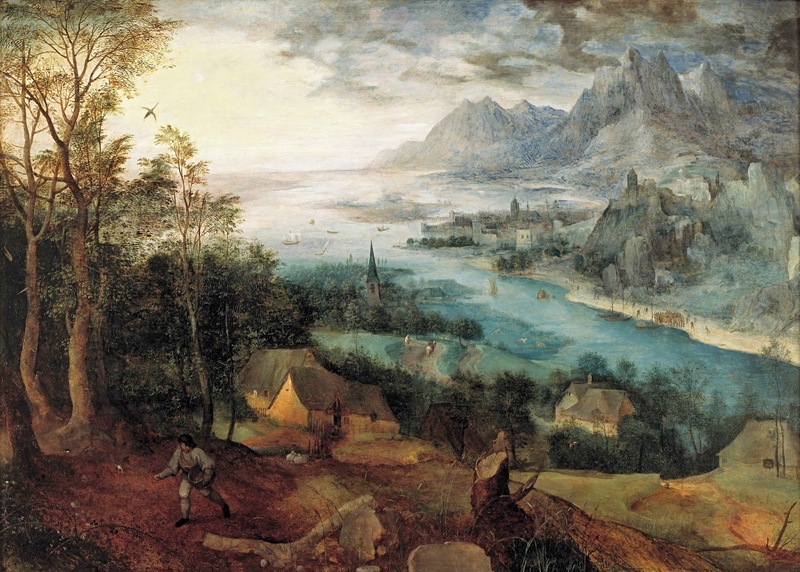 The highlight of the Dutch room, however, is Pieter Brueghel the Elder's Parable of the Sower (1557), which contains simply stunning turquoise, blue, and brown in its landscape, which is so dazzling that it distracts the viewer from the sower himself. Across the hall, which contains a bronze cast of Giambologna's Mercury, is the second set of three galleries. The first is the Italian and Spanish room, containing works by Bartolomé Esteban Murillo, Paolo Veronese, and Giovanni Francesco Barbieri (known as Guercino). 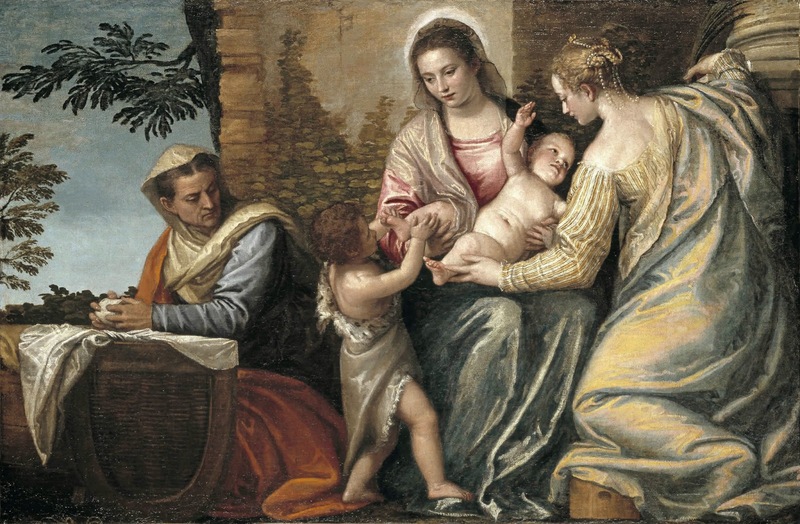 I was quite pleased to see Veronese's Madonna and Child with St. Elizabeth, the Infant St. John the Baptist, and St. Catherine (1565-70), since I enjoy taking in his robust, majestic figures and his dynamic compositions. Next, I visited the Timken's collection of Russian religious icons, which includes the odd Our Lady of the Third Arm from 18th century, which depicts the Virgin Mary with a strangely placed third arm, as the title indicates. Other than that piece, the works in this section were not to my taste, but the collection does seem quite extensive for a small museum. 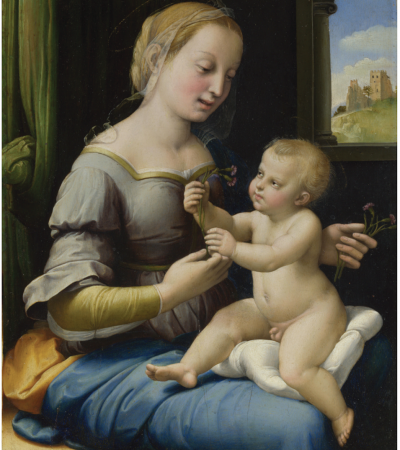 The true highlight of my visit, however, lay in the traveling exhibit the Timken had on display: Raphael's tender, intimate Madonna of the Pinks (1506-7), on loan from the National Gallery in London. The painting has its own room in the second wing of the museum, with plenty of information about the artist as well as the painting itself and its long journey to attribution. The painting is quite small and borrows its composition from Leonardo da Vinci's Benois Madonna. At this point in Raphael's career, he was shedding earlier style, which was influenced by his master Perugino, and developing a new style; Leonardo was quite influential to Raphael at this time. Despite the compositional similarities, the coloring and placidity of the composition is all Raphael's, with none of the sinister elements of Leonardo's work. Overall, while small and solely focused on pre-twentieth century art, the Timken Museum is worth a visit if you are in the San Diego area. Also located in Balboa Park are the Museum of Photographic Arts and the San Diego Museum of Art; the three art museums would make a nice little trip if you're visiting San Diego. Madonna of the Pinks is on display until April 26, 2015.